Fuelmyblog is a website that offers squares (40x40 pixels) for bloggers, that helps bloggers introduce their blogs to other people. 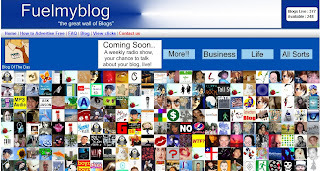 You must submit blog or Myspace site, that is free. Fuelmyblog looks cool, seems similar Million Dollar Homepage. Another similar site is Millionringgithomepage, but free use just available 4 boxes and 182 days.